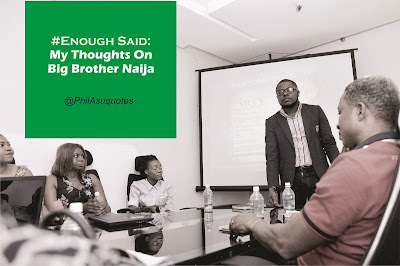 My Thoughts on Big Brother Naija? I have heard and seen so many arguments about this reality TV show called Big Brother Naija. On one side, many condemn it with varying reasons while on the other, some say there is nothing wrong with it and even go on to call those who condemn it ‘hypocrites’. Thus, I will lend my thoughts to it. America’s STUPID INDEX is known to have risen quite disturbingly with the influx of reality TV shows back in the early 2000s. To salvage this, American content creators and government met and decided to use the media to educate Americans and make them become smarter and thus reduce the stupid index. The outcome of this is the making of science fiction TV series and inclusion of intelligent conversations in popular TV shows and movies. In no time, these made America’s growing generation become smarter than the previous and yes, we have seen them leading in many tech related sectors. Many people have wanted me to talk about the current BIG BROTHER NIGERIA show currently showing on cable TV. This is my take on it. In the face of a global drive towards a tech-driven future, Africans are glued to the screen giving their eyes to what many have argued over its adding little or nothing to their brainworth. The argument of the pro-BBNaija divide is that it is ‘just entertainment’ and that people who criticize it do worst than what the housemates do. However, gone are the days when TV was just for entertainment purposes only. Countries like America are actually using TV/Films to position the minds of their youths to become smarter and more in tune with the realities of the incoming age. Next year, the world’s first flying cars will be launched and orders are already being made from this month. They costs between $400,000 and $600,000. Ofcourse those cars will be ordered from all over the world. Not only will it increase the GDP of the country of its makers but it will also move the world way forward into the awaiting reality of the global future. Do we remember how many Science fiction movies and TV series that showed this reality over and over again before now? The developed world does not leave media to charlatans or see it as just for entertainment purposes only. The media can be used to show a reality which eventually becomes what is rife in the society. It is used to show viewers what realities to aspire for and can either be used to position the minds of a people right and raise a generation of smart youths who reach out and do exploits OR it can be used to increase the STUPID INDEX of a people. I’ll say one thing without mincing words, #BBNaija is yet another one of those shows that will and is already increasing the STUPID INDEX of Africans. Is there nothing wrong with having a show on TV that shows footages of married and single people going bare-breasted and having foul indulgences in the full glare of a viewing public (even their families are watching including maybe their kids) and then rewarding N25million to the winning housemate for being in a house like that? What exactly are the winners being rewarded for? What are we encouraging the youths watching it to do eventually in society? Have we thought of the children that will grow up seeing footages of their moms/dads on youtube with sleazy acts and how this will affect their reality or are we thinking of only ourselves and voyeuristic hunger? TV shows like ‘Who wants to be a Millionaire’ actually rewards people for answering smart questions and thus not only makes the viewers learn what they may not know but shows that you can be rewarded for being smart. We complain of the government and every other thing but what do we accept that will become an Achilles heel for our sound existence tomorrow? Just as Americans deliberately used film/TV to raise a generation of smart citizens, we shuld realize that what we expose our youths to eventually becomes what they make society become. Dear Africans, it is up to you. You need to know more to be able to do more. Whatever content you expose yourself to on a regular either makes you know more or makes you know less than you should. It’s either your INTELLIGENCE is being fed or your IGNORANCE is being entertained with graver ignorance. Dear BBNaija lovers, no we are not all perfect and some of us may be doing worse ‘stuff’ than what the housemates are doing on TV like you are quick to say but trust me, the effect of constantly exposing a generation to the depravity of society does not only embolden the depraved but also raises a generation of depraved minds eventually. Is anyone looking at the STUPID INDEX of Nigerians like the Americans looked at theirs keenly and introduced the kind of content that is raising smart Americans and preparing them for the coming tech age? Why is America and developed worlds focusing on Technology and giving us more ‘science techy’ scripts for TV, films, events and even in music videos? It is because technology is the engine room of prosperity.They are exposing their own to this. Let’s expose Africa to the right content and watch Africans rise from ignorance and the rather slipshod reality of it’s today. It will require deliberate content that ‘smartens’ put through to us through the media (TV, Film, Radio, Online, Print) and the reduction of the kind of content that depraves Africans and keep our minds in the gutters. Why have I used America as the yardstick over and over again? The Big Brother show is not Nigerian. It is a foreign TV franchise. If we must mimic or run franchises from international platforms, let’s ensure we take that which is moving them and the world forward. Let's deliberately reduce our STUPID INDEX with content that will help do so. I am concerned about Africa’s relevance in the global future. You should be too. NB: Feel free to share this if you want to. You can also post it on your blogs/website. Philip Asuquotes is a strategy consultant, poimen and futurist. He studied Mass Communication in the University of Nigeria Nsukka and has been active in the sphere of branding and public relations. He is the convener of PAQ SESSION, a live intellectual and thought leadership summit. He can be reached via philipasuquotes@gmail.com or @philasuquotes on Twitter,Facebook and Instagram.